The bones in our leg and foot meet to form our ankle joint. The leg contains a large bone, called the Tibia and a small bone called the Fibula. These bones rest on the Talus bone in the foot. The Calcaneus bone, our heel, supports the Talus bone. Our heels bear 85% to 100% of our total body weight. 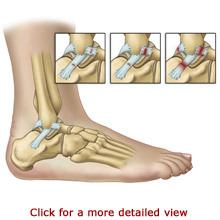 The LCL is composed of three separate bands that are commonly referred to as separate ligaments. 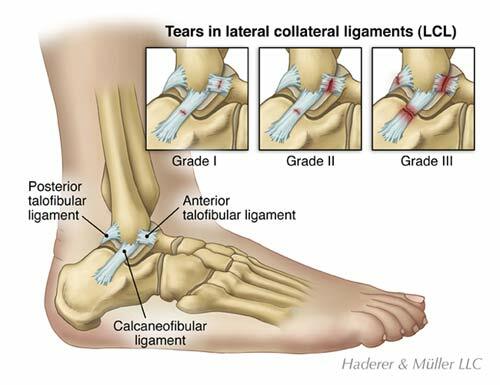 The Anterior Talofibular Ligament is the weakest and most commonly torn, followed by the Calcaneofibular Ligament. The Posterior Talofibular Ligament is the strongest and is rarely injured. Ankle Sprains rarely require surgery; however, it is an option when non-surgical treatments and rehabilitation fail. Each case of Ankle Sprain is evaluated on an individual basis. Your physician will discuss surgical options and help you determine the most appropriate choice for you. The majority of Ankle Sprains heal without surgery. It is imperative that you seek evaluation and treatment for any ankle injury, as sometimes fractures are mistaken for sprains. The treatment of an Ankle Sprain depends on its Grade. Grade 1 sprains are treated with the RICE method - Rest, Ice, Compression, and Elevation. You should initially rest your ankle. You may use crutches to help you walk. Applying ice packs to your ankle can help keep the swelling down and reduce pain. You should apply ice immediately after spraining your ankle. Your doctor will provide you with a continued icing schedule. Your doctor may recommend over-the-counter or prescription pain medication. Compression bandages, such as elastic wraps, are helpful to immobilize and support the ankle. You should also elevate your ankle at a level above your heart for 48 hours to help reduce swelling. Care for Grade 2 sprains includes applying the RICE method of treatment and in most cases your doctor will prescribe an ankle air cast or soft splint for positioning and stability. As healing takes place, your doctor will gradually increase your activities. Your doctor may recommend that you wear an ankle brace for stability as your healing continues. In addition to the primary care, your doctor may recommend a short leg cast or a cast-brace system for a Grade 3 sprain. The cast is typically worn for two or three weeks and followed by physical therapy. Your physical therapist will initially help you move and stretch your foot. The movement can be helpful to improve circulation, reduce swelling, and improve range of motion. As you progress in physical therapy, you will participate in exercises to strengthen your muscles. Physical therapy is helpful to decrease pain and swelling and to increase movement, coordination, endurance, and strength. Your physical therapist will help you walk again. You may need to wear a customized insert for your shoe or special shoes to help you maintain proper ankle positioning. Grade 3 sprains have severe impairment and may take several months to fully recover. Even after a full recovery, some patients find that swelling still might occur. In most cases, rehabilitation will help restore strength, mobility, and range of motion. Recovery from surgery differs and depends on the extent of your injury and the type of surgery that was performed. Your physician will let you know what to expect. Individuals usually wear a cast for up to two months following surgery. Your doctor will instruct you to carefully increase the amount of weight that you put on your foot. Rehabilitation following surgery is a slow process. Individuals typically participate in physical therapy for two to three months. Physical therapy helps to strengthen the ankle muscles and increase movement. Success rates are high for both surgical procedures. The majority of individuals achieve an excellent recovery in about six months.